The next cake in the line up for the Modern Baker Challenge is cocoa génoise. Flush with my recent success with a classic génoise, I was looking forward to making the cocoa variation. First, a correction. The original hardback edition of The Modern Baker contains an erratum in the instructions. 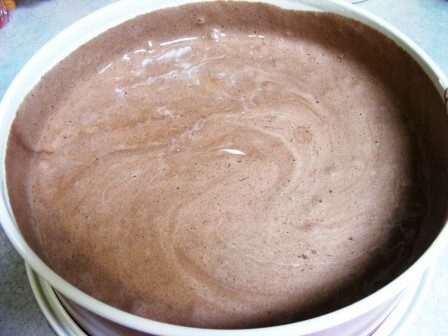 The book says to use 1 cup all-purpose flour for the cocoa génoise; it should read 1/3 cup all-purpose flour. This erratum was corrected in the paperback version of the book. 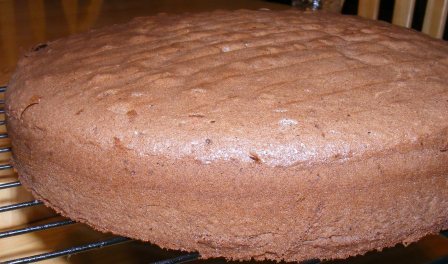 The cocoa génoise recipe is based on the classic génoise recipe, the only difference being the amounts of flour and cornstarch and, of course, the addition of cocoa. Otherwise, the ingredients and instructions are the same. It didn’t bake up quite as high as the classic génoise. I had to work a little harder to get the cocoa and flour mixed it, and I think I deflated the egg foam a bit. Nevertheless, it was light, airy, and delicious. And I was still able to cut it into three layers. You’ll have to check back in a few days to see what I used them for….